Department of Bacterilogy ICMR-NIRT has been assessed and accredited in accordance with the standard ISO15189:2012 "Medical Laboratories - Requirements for quality and competence"
"Xpert Pediatric Request form -FIND-RNTCP-Ped TB"
The Bacteriology department has been in existence since the inception of the centre and h as been supporting controlled clinical trials and projects conducted by the National institute for Research in Tuberculosis (NIRT). 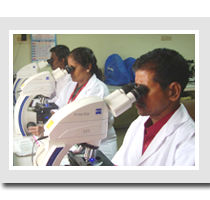 Routine activities of the lab include diagnosis of tuberculosis by smear microscopy, culture and drug susceptibility testing (DST) of Mycobacterium tuberculosis (MTB) for patients under clinical trials and outside referral cases. In addition, the department has carried out drug resistance surveillance (DRS) studies for estimating the prevalence of resistance to first line and second line drugs in the community. 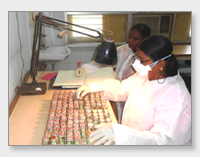 The Department forms a major component of the NIRT, functions as a training centre for mycobacteriological techniques and for training medical and para medical professionals in different capacities. Other than the routine activities the department is also involved in basic and applied research on mycobacteriology. P hage based rapid diagnosis and drug susceptibility testing for M. tuberculosis , phage genomics, applications of phages in the study of mycobacteria, drug discovery and evaluation of emerging methods (technology/ kit) for rapid diagnosis or drug susceptibility testing has been one of the prime focus of the department. Screening of natural and synthetic compounds for antitubercular activity development and evaluation of rapid methods for detection of M.tb and optimization of already available conventional methods are some of the ongoing activities. The laboratory functions as a National Reference Laboratory under the Revised National TB Control Program (RNTCP) and extends its technical support to ten states of India for training the program personnel, ensuring External Quality Assurance in sputum microscopy etc. Other activities under RNTCP include inspection and certification of laboratories for performing culture and DST to first line and second line drugs through proficiency testing. As part of supranational Reference Laboratory under WHO, External quality assurance and proficiency testing for DST to first line and second line drugs are being carried out for National and SAARC reference laboratories for tuberculosis. Further, the department provides diagnostic services to the state of Tamil Nadu under Programmatic Management of Drug Resistant TB (PMDT) using its Line Probe Assay facility. The study was undertaken to determine the effect of storage of sputum at room temperature on diagnostic procedures such as smear and culture, with a view to simplify transport of samples from distant areas to reference laboratories. It was found that three days storage at room temperature resulted in loss of viability of tubercle bacilli while smear was unaffected even after 4 weeks of storage at room temperature. The study established the need for a transport medium for sputum samples for effective diagnosis and for studies such as drug resistance surveillance. 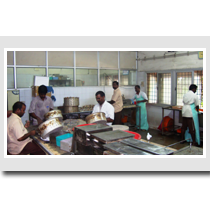 The study was taken up to determine the proportion of initial and acquired drug resistance in cases of pulmonary tuberculosis in Tamil Nadu, in order to use the level of drug resistance as a performance indicator of the National Tuberculosis Programme using guidelines prescribed by the WHO/IUATLD Working Group on Anti-tuberculosis Drug Resistance Surveillance. It was found that there was gradual increase in initial drug resistance over the years in this part of the country. Phenol ammonium sulphate (PhAS) sedimentation of sputum renders it safer for smear microscopy. The study was taken up to evaluate the method in comparison with direct microscopy with culture as the gold standard. It was found that both methods were comparable in terms of sensitivity and specificity. But the PhAS method was better accepted by the laboratory technicians being safer, but necessitated an overnight sedimentation, with delay in reporting of results by a day. Conventionally, sputum smears are prepared on glass slides before being stained for AFB microscopy. In the current study, an attempt was made to stain the tubercle bacilli in the container itself before the smears were made. 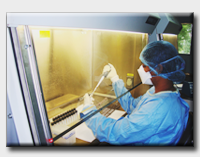 This method not only reduces the work load and time but also renders the sample safer for handling. Well stained acid fast bacilli (AFB) were demonstrated in smears prepared from pot stained sputum and smear results were comparable with conventional ZN method. In a second study, sputum was pot stained by the addition of phenol ammonium sulfate basic fuchsin solution and stored for 2 hours at room temperature. 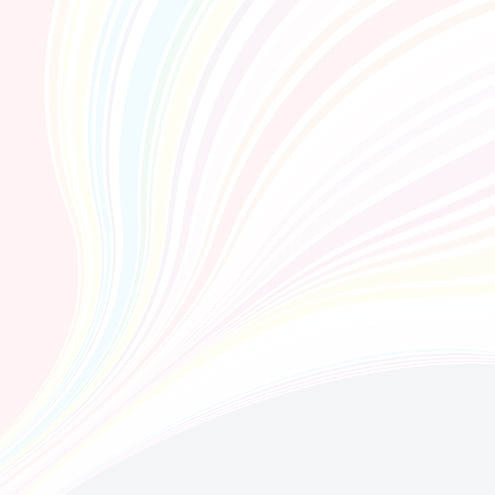 The smear results were comparable with conventional ZN method. In an effort to develop luciferase reporter phage (LRP) constructs with high sensitivity of detection, attempts were made successfully for isolating a temperate mycobacteriophage capable of infecting and lysogenising M. tuberculosis. Such a phage Che12 was isolated, characterized and LRPs constructed. The efficiency of the construct was found to be higher than the existing LRPs with cultures as anticipated. The attempt marked the beginning of diverse attempts to improve the LRP diagnostic assay. The luciferase reporter phages (LRP) show great promise for diagnostic mycobacteriology. Since the tuberculosis (TB) cases among HIV infected population result from the reactivation of latent bacilli, development of LRPs capable of detecting dormant bacteria would be useful. In a milestone study, 3 LRP constructs were developed using promoters of genes functioning during dormancy. These LRP constructs exhibited detectable luciferase activity in dormant as well as in actively growing M. tuberculosis . Organisms of the normal flora that survive the action of the decontaminating agent during sputum processing can cause heavy contamination of the culture, especially liquid culture. Antibiotic supplements are used in liquid cultures to control such growth despite reports that these agents have deleterious effect on the tubercle bacilli. This study demonstrated a novel hypothesis that a cocktail of phages that infect and lyse these organisms could be used in liquid cultures instead of the antibiotic supplements with better decontaminating efficiency and M. tuberculosis retrieving capacity. Further study established the feasibility of using phage lysin supplement to phagebiotics in decontaminating processed sputum samples in liquid culture of M. tuberculosis . The study opened up new possibility of developing a novel biofriendly method of sputum processing. Since the introduction of Rifampicin forty years ago, no effective anti-TB drugs have been discovered. The rate of multidrug resistance is also on the increase. New drugs are desperately needed to overcome this situation. An attempt was made to identify effective anti-TB compound from marine habitat. This is the first report on a novel anti-TB compound, Transitmycin isolated from actinomycetes of Indian marine origin. It is unique and first of its kind in its activity against M. tuberculosis and HIV. The department is equipped with BSL3 laboratory with an area of 1399 sqft and total lab space amounts 3551sqft, one of the largest mycobacterium research and diagnostic facility in India. Media such as Lowenstein Jensen slopes, blood agar etc. 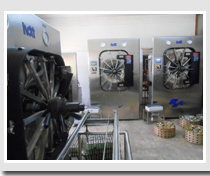 are prepared in-house. 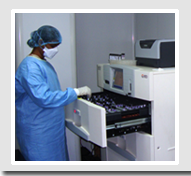 Instruments and equipments such as Class I cabinets (6), Class II B cabinets (14), BACTEC MGIT960 (2), HPLC (1), fluorescent microscopes (5), light microscopes (16), iLED microscopes (5), Luminometers (3),Thermocycler (2), Centrifuges (12), refrigerated centrifuge (3), CO 2 incubators (2), inspissators (5), water distilling units (1), deep freezers (5), autoclaves (3), Gel Doc apparatus (1), HPLC (1) Shaking Incubator (2) Sonicator (1) Electrophoresis unit (1) UV trans illuminator (1) are available. A walk in incubator 10 X 20 square feet and two walk in cold rooms (10 X 10 and 10 X 20 )are in use exclusively for the department. An additional molecular biology lab is on the pipe line. All infected materials are autoclaved before discarding. All staff are fully trained in procedures. SOPs for all activities are in place. Shared facility available : Molecular biology laboratory facility includes applied bio system 3100-Avant™ DNA Analyzer, 4800 MALDI TOF/TOF™ Intact Proteins Analyzer, flow cytometry and sorter, Applied Biosystems® 7500 Real-Time PCR System, and thermo cyclers. The training facilities at the centre has 100 seat auditorium, a large conference hall and three smaller conference rooms and they are equipped with audiovisual aids such as LCD projectors, slide and overhead projectors and sound system. Workstations and serves connected by LAN are available and supported by internet connectivity using a 1 Mbps dedicated leased line, video and tele-conference facility is also available at the institute. Statistics department assists in evolving research protocols of various investigations and procedures for the successful conduct of controlled clinical trials and for several laboratory studies. A state-of-the-art “Waste water treatment plant” has been installed. Surveillance for first line and second line anti-tuberculosis drugs. Speciation and drug susceptibility testing of NTM. Modified Pot method of staining acid fast bacilli using phenol ammonium sulfate basic fuchsin tablets. Multicentric study on drug susceptibility testing for first line and second line drugs using luciferase reporter phage assay. Evaluation of an indigenously developed point of care technology for rapid diagnosis of tuberculosis. Molecular detection of drug resistance to first line and second line drugs. Performance of iLED microscope in different settings – Multi-centric studies.